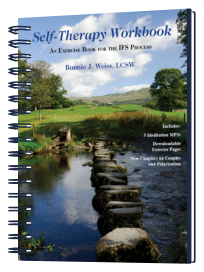 This workbook is a companion book to Self-Therapy by Jay Earley, PhD. Self Therapy lays out the step-by-step process of the Internal Family Systems Therapy Model originated by Richard Schwartz, PhD (www.selfleadership.org). The book is designed to facilitate learning the basics of the IFS process. The workbook takes you step-by-step from accessing a part by working with Protectors through getting to know and heal the more fragile, exiled parts of the psyche. The format of integrated concept descriptions and exercises is ideal for individual exploration, small groups, or classes. Exercises can be done on one’s own or with a partner. The workbook structure allows for journal-style following of your process.